Igawa Takeshi, who lives and works in Saga City and is Associate Professor at Saga University in Kyushu, uses the most traditional of Japanese craft materials, but is one of the most closely watched young artist in the field of contemporary lacquer art because of his daring and expressive sculptures. Known as urushi in Japanese, lacquer is the sap of a tree related to the sumac family, and has been used in Japan as an adhesive and a coating (including decoration) for more than 9000 years. Among the distinctive features of lacquer are the gloss and depth of the surface and the pleasing tactile experience, which IGAWA features in his sculptures. 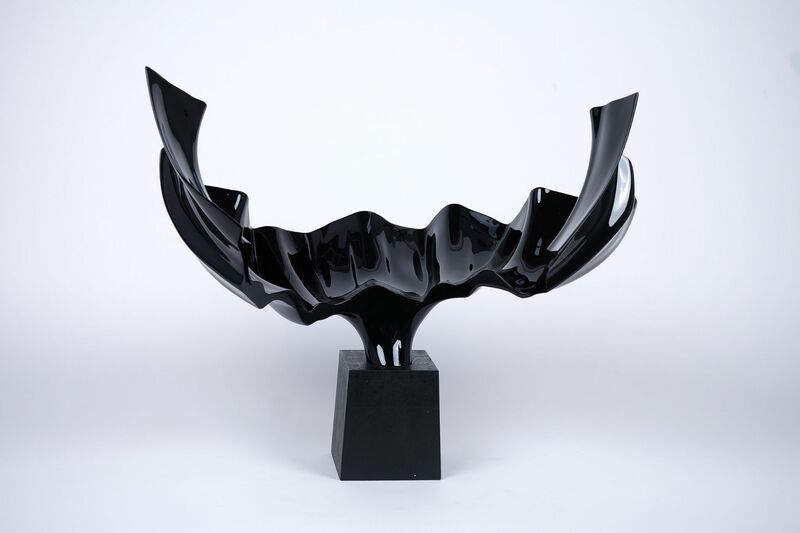 Pools of mysterious shadows, sudden illuminations, deep sensual reflections, vast planes of black, sharp angles and the softest of curves – Igawa Takeshi’s grand sculptural works evade instant comprehension. Conceptually based on the infinity of sea and sky, the impenetrable obscurity of black, and using the natural lustre of Urushi lacquer, Igawa uses the freedom and fluidity of kanshitsu, the dry lacquer technique that traditionally uses a fabric mold rather than a wooden substrate, to create form.